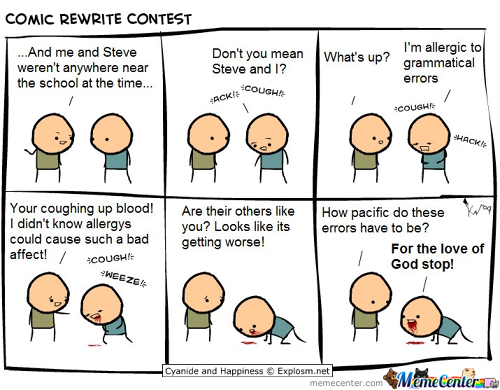 One of the things many of you have expressed frustration over is grammar and punctuation. Conversely, some are probably sick of going over what you already know, but that’s OK, you’ll live :). I remember this frustration myself as I had little to no dedicated grammar instruction in school, didn’t understand when I got things wrong, and didn’t even know there were rules until I taught myself this stuff in my twenties. Insert facepalm: “you mean you don’t just go by what sounds write and put comas where there is a paws?” Steven Pinker and the whole language movement is to blame. The theory is that we learn language intuitively, by ear. But that’s predicated on the false assumption that we are around people who speak proper English all the time and spelling and homophones are logical. “But spelling don’t make no sense cause some of it is reminisent of middle english while some is modernized tha peeple that rote the first grammer and spelling books didn’t create no patterns either dey jus did wat dey felt like.” So, um, yeah, that’s what whole language writing looks like. I’ll leave the rest of that digression for another day though.